Schools recognized this year range from very small to very large. All face challenges, but all are progressive, and are meeting obstacles head-on with action, as shown in the bulleted highlights below. Congratulations! 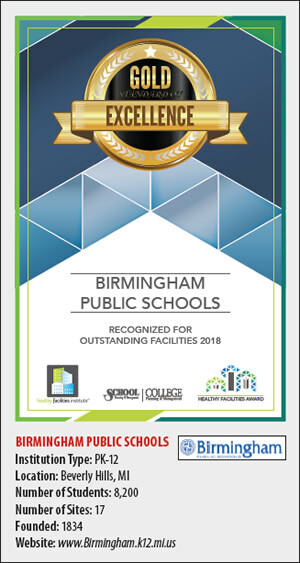 Birmingham Public Schools (BPS) is receiving the 2018 Gold Standard of Excellence recognition for its holistic approach to healthy indoor environments; notably, indoor air quality (IAQ). Stellar IAQ—Classroom air is consistently cleaner than outdoor air. BPS frequently tests indoor air for the presence of particles and gases and uses portable devices to assess IAQ, including taking measurements of airborne particles; CO2, CO, temperature, relative humidity, and dew point; VOCs, oxygen, hydrocarbons, other substances; non-viable mold/pollen; and viable mold/bacteria. HVAC filters (MERV 7) are changed on a rigorous schedule, with a focus on actual air quality rather than high-tech equipment (although they have that). They most value the outcomes produced through ventilation and moving the right volume of air through appropriate media as part of a system to optimize air cleanliness for the application, rather than touting the best filters or air tech. STEM lab areas have been updated with specialty air cleaning units, and the six natatorium (indoor pool) environments have increased ventilation. Carbon dioxide sensors are in every HVAC system to help control outside air intake, including in all classrooms. BPS uses Integrated Pest Management (IPM) to address prevention and eliminate pest harborage (e.g., removal of food sources), rarely using pesticides. BPS tests all water sources that students drink from including those not required by law, such as lab faucets where students often fill water bottles. BPS has a sound meter-based testing program during occupied and unoccupied times to prioritize and attenuate noise issues. BPS operations staff works with architects and engineers as new construction is planned and launched, to ensure cleanability and help optimize other health factors. BPS buildings have 15+ feet of entry matting to prevent tracking in contaminants which can become airborne and create other exposure issues. BPS custodial uses truck-mounted extractors to frequently deep clean carpet, a measure associated with better IAQ. Spray-and-vac restroom cleaning machines enable more thorough removal of soils and bio-pollutants than manual methods. Hand sanitizer is provided in corridors. BPS uses cameras with 30-day digital storage; security vestibules at all schools; classroom doors with locks for quick access and ease of use; card security access for staff including tracking users; and an exterior door locking program that is tested six times annually. Buses have GPS systems; internal and external cameras; pre-trip inspection, and systems monitoring. 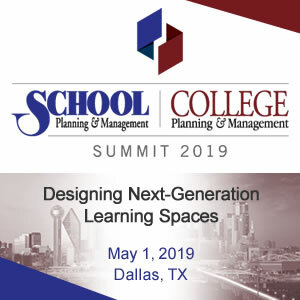 BPS is focused on “social / responsible” return on investment (ROI), not just fiscal ROI; i.e., believing “doing the right thing” is investing in the educational success and health of students for optimum social ROI. 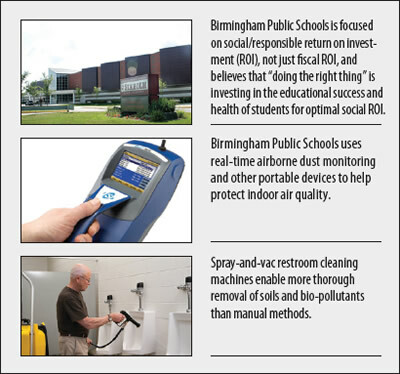 Birmingham Public Schools (BPS) is also receiving a Kaivac Lithium-ion-powered OmniFlexTM AutoVac and a case of Kaivac’s Neutral Floor Cleaner as part of their recognition. The high-performance floor cleaning machine that’s three to four times faster than a mop removing soils from the floor surface is valued at $2,439 and is donated by Kaivac Cleaning Systems, sponsor of the Healthy and Safe Facility Handbook – School and College Edition, which can be found at www.healthyfacilityhandbook.com. 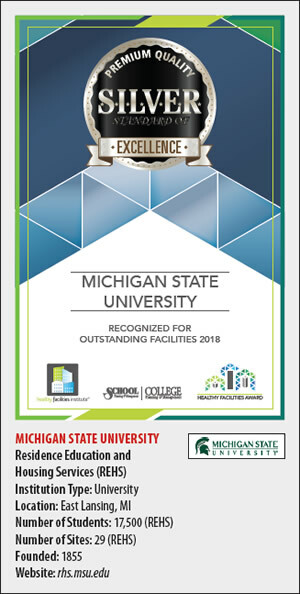 Michigan State University (MSU) Residence Education and Housing Services (REHS) division is receiving the 2018 Silver Standard of Excellence recognition for its programs fostering healthy indoor environments with major human impacts. Robust indoor air quality program, including preventive maintenance on HVAC, and regular filter changes for better IAQ; reducing cost of ownership and replacement cycles. Providing safer water: Filtered bottle-fill stations throughout residence halls. Annual mandatory training program for full-time employees−including custodial, maintenance supervisors, and support staff−focusing on best practices and compliance; e.g., asbestos training, ladder safety, heat stress, chemical safety, workplace violence, active shooter training, CPR, spill prevention and cleanup, food safety, back safety/lifting practices, ergonomic training, and more. Custodial Tech training program for full time staff, covering four areas: 1) Expectations, 2) Chemical and cleaning product training, 3) Equipment maintenance and training, and 4) Sustainability. Green cleaning policy and program (high-performance cleaning). ISSA CIMS and ISSA CIMS-GB certified with honors. Extensive use of entry mats at residence halls to reduce contaminants entering buildings. Aqueous ozone on-site generation system reduces use of conventional cleaning chemicals by more than 80 percent. Reduced chemical exposure has lowered chemical-sensitivity reactions. Hydrogen peroxide-based tuberculocidal disinfectant used for touch-point cleaning, meeting bloodborne pathogen and other hygienic requirements. Extensive use of microfiber cleaning cloths and tools. Security: Cameras in all residence halls; card access systems in residence halls and apartment buildings; all workers pass background checks prior to employment; non-REHS personnel are escorted while performing services within residence halls on living wing floors; employees adhere to standardized uniform dress code with name tags and IDs; two-way radios carried by employees in residence halls. 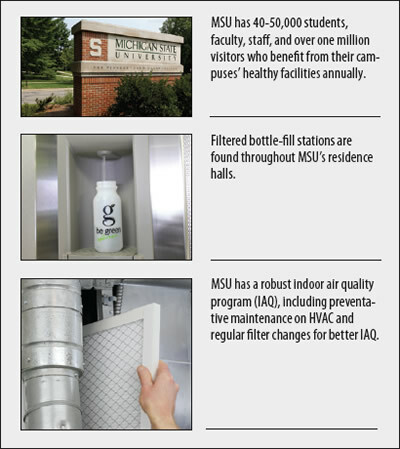 Human impacts: 40,000-50,000 MSU students use REHS services; 11,000 part- and full-time employees work in residence halls, teaching, occupy office space, or visit and use dining facilities; 80,000 conference attendees/customers use REHS in summer months; 25,000 prospective students tour campus and residence halls annually; one million+ visitors to campus yearly. 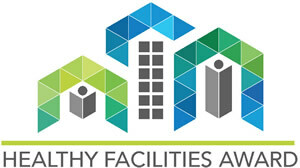 The New School is receiving the Healthy Facilities Advocate recognition for modeling best practices in several areas, and healthy materials education. Use of advanced Demand Control Ventilation (DCV) in the University Center building, provides ventilation for better IAQ based on several contaminants including carbon dioxide, VOCs, and non-human pollutants−not solely occupancy. Smart DCV takes air samples at 20-30 different locations routed in sequence to shared sensors, enabling real-time adjustments to ventilation rates based on actual air quality. 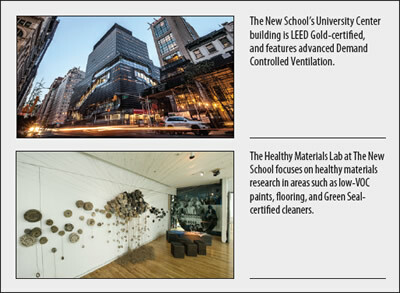 Healthy Materials Lab: Research center dedicated to healthy materials research, product libraries, and affordable housing. Healthy Materials Library: Source of information for students and faculty in advocating healthy materials use. Facilities practices and policies: Preference for low-VOC paints, flooring, Green Seal-certified cleaners.